Comments: Broadleaf deciduous tree native to Eastern United States and Canada. Leaves of this species are light-green and broadly ovate with three apecies. 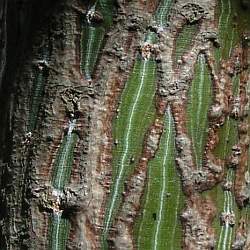 The bark of the tree is green with lighter green vertically stripes. This species usually grows to 30 foot and broadens out so that the top canopy is somewhat flat. Though it has good fall color (yellow) the bark is the distinctive feature of this species. 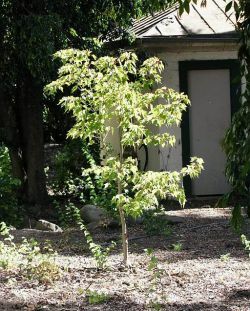 Other common names for this species are Moosewood, Whistlewood and Snake Bark Maple.